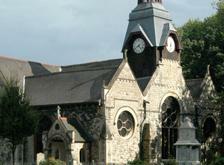 St Matthias Church is the oldest building in the Docklands. Description: This former church now fabulous community centre is the oldest building in the docklands and a bit of a conundrum. Externally it looks every bit the classic Victorian gabled church but inside its a rare example of a mid-seventeeth century classical church. Originally formed as Poplar chapel serving the local residents of Poplar and Blackwell, it also served the East India Dock Company who had large premises and workforce nearby. It miraculously survived the blitz but didn't survive the seventies when it was closed in 1977 due to a merging of local churches.